The mantle" as it is called, is detectable by seismic refraction and is a shell of the Earths interior extending from a depth of about 20 km below the oceanic crust down to 2900km, or about halfway to the centre of the Earth. This zone makes up the bulk of the Earths volume and is the primary source of all basaltic igneous rocks found at the surface. Increasing temperature levels with depth have an average gradient of about 25 deg C/km is caused mainly if not entirely by the radio-active decay and release of energy by the disintegration of isotopes of Th, U and K, with some minor contribution from other isotopes and possibly frictional distortion caused by lunar passages. Similarly, Mt Richards. Red Mountain to the far distance with White Slip (in Livingston Volcanics in the top right hand corner). This temperature gradient and resulting induced density gradients causes the mantle to slowly convect at a rate of movement of up to 16 cm per year, rising along the mid-oceanic spreading ridges and sinking at the subduction zones along the continental margins and carrying with it the overlying crust. Without such movement we would have no ocean basins, no mountain ranges and without the continual replacement of rock material removed by erosion by fresh volcanic rock or by sediments thickened and uplifted by orogenic movement, we would have no continents, merely a globe covered by a continuous shallow sea. Without the continuous outgassing of the circulating mantle neither in fact would we be likely to possess either more than the shallowest of oceans or more than a tenuous atmosphere, a situation seen in the planet Mars, which seems to have no circulating mantle, spreading centres, subduction zones or orogenic mountains; merely a few basaltic volcanoes and a very thin atmosphere in which Ar 40, (released by the decay of K40) is prominent. At an average circulation rate of 4 cm per year, in 4.3 billion years a section of upper mantle may have moved about 100,000 km since the original creation of the earth. If a large convection cell is about half the diameter of the earth, the mantle section may have turned over about four to six times, not enough to homogenise the mantle as a whole as the circulatory flow must mainly be laminar rather than turbulent. but certainly enough to result in considerable depletion if subjected to partial melting four times. Why do we not see the results of this? It is possible however that the cold descending lithospheric slab descends to great depths while the upwelling section entrains or consists entirely of hotter undepleted mantle. Again, the descending oceanic crust along subduction zones has been highly enriched in LILE relative to mantle and also has a lower melting point than the depleted mantle and this will "re-fertilise" the depleted mantle to some degree. The only loss to the system are the island arc and continental andesites partially melted from descending lithosphere at the subduction zones. What the composition of the residue from this secondary partial melt process is, we have little idea, but even such a residue must be more enriched that the original mantle. We should be able to derive some approximations by removing from an average MORB a series of percentages of average andesite, while a norm program will give an estimate of the mineralogical make-up of such residues, a good class exercise! The mantle is too deep to be reached by current drilling techniques, and the upper mantle is not likely to be representative of the whole for reasons given below. A great deal of the current literature is given to speculation as to the composition of the mantle as inferred by basalts and other rocks rising to the surface as magma which are generally accepted and demonstrated by high pressure experiment to be the partial melting products of a peridotitic mantle. The compositions of crystallized magmas found at the surface are in one sense amazingly homogenous in that that they have not changed with time, basalts now being emitted along oceanic ridges and on oceanic islands are similar to those found in the Archaean, at least 3.5 byr ago, but the Archaean does seem to be, on average, enriched in LILE elements. On the other hand both Recent and ancient lavas are quite varied at any one time period, the primary magmas, unchanged by fractionation processes while cooling, range from quartz saturated tholeiitic basalts to basanites to melilite mela-nephelinites. We can now be almost certain that much of the range seen in Oceanic Ridge basalts for example, which may range from those extremely depleted in the incompatible elements Cs, Rb, Ba, U, Th, Nb, K and the light REE, (the so-called NMORBs) to those very enriched in these elements (the EMORBS) is due entirely to the degree of partial melt of the mantle, the range guessed from experimental work to be from 4-5% down to less than 1%. Superimposed upon this we have the less certain effects of pressure on the composition of the melt as suggested by experimental work. At greater depths and pressures > ~19 KB in the mantle plagioclase disappears and become aluminous spinel and then at >20 KB garnet while olivine may become a cubic mineral. Garnet-spinel-olivine-omphacite do not have the same solid-melt partition coefficients as does olivine-plagioclase-pyroxene. The stabilty fields of olivine-clinopyroxene-orthopyroxene-plagioclase-spinel also changes with pressure. Mineral lattice spacings may also be compressed. Common basalts under pressure are thought to become eclogites with omphacite-garnet instead of pyroxene-plagioclase. Potash feldspar is not found at high pressure, some K may be contained in plagioclase etc but the usual potassic phase is a potassian mica, phlogopite. Extremely enriched rocks such as the lamproites, are probably of very low degree melt and generated under high pressure deep in the mantle. Some magmas may be highly sodic for example with Na/K ratio of >3. Others, sometimes situated not far distant, may be highly potassic with Na/K<1. Are such variation due to variabilities in the mantle or are they due to differences in the conditions of partial melting? Small degree melts in the Macquarie basalts (Kamanetsky, 2000) are more potassic than larger degree melts. Great confusion is seen in the literature where minor differences in some element ratio, which is demonstrably due to difference in degree of melt, or to fractionation may be attributed to inhomogenous mantle, metasomatised mantle, striped mantle, veined mantle, magma mixing, lithosphere contamination, previous depletion of mantle and many other speculations. As many of these can be shown to be wrong and none can be proven correct, we have often moved quite away from science. Such views must be read with a good deal of caution IMHO. Much effort and enormous sums have been spent on isotopic research. The quite large variations in Sr 87/86, Nd 143/144, Pb206, Pb 207 and Pb 208 found are claimed to be proof of mantle heterogeneity, but there are other possible explanations, (see "Isotopes" chapter). When we assemble all data available for the isotopic variation in leads, we find that in general the more potassic magmas as opposed to the sodic ones have a higher ratio of Th/U, and a higher Pb 208/204 is therefore to be expected provided the difference has been maintains for some millions of years to enable radioactive decay to produce significant differences in radiogenic vs common lead. More sodic magmas tend to have lower Th/U and hence higher Pb 206/208 and sometimes at least higher Pb 206/208. This infers that the difference in Pb 208 and 206 have existed for great periods of time, so thus may indicate that the sources of sodic and potassic magmas may not be the same. However it is highly likely that isotopic enrichment takes place along with partial melting, (see "Isotopes" and such enrichment could be selective. Isotopic information must be used with caution. Comparison of Archaean with modern basalt and andesite compositions. Examining all available data has lead us to the conclusion there has been some mantle depletion with time but that the volumes of mantle now being partially melted is only minimally depleted and not greatly changed over a period of 4 byr approximately. (see diagrams in Archaean chapter). Removal by partial melting of the entire volume of basalt making up the sea floors of the Atlantic, Pacific and Indian Oceans, must have depleted at least some of the mantle nevertheless, but depleted NMORB-type basalts are still found in the Archaean even if they are perhaps not so common. Examining lherzolitic residual or cumulate nodule data from (mainly) alkali basalts. Basaltic, basanitic or nephelinite flows often contain chunks of rock or nodules of lherzolite, harzburgite and dunite of high pressure mineralogy including garnet, and/or spinel which appear to have been carried up from the mantle. These appear to all form a semi-continuous series between alkaline basalt and pure olivine dunite, eg see chapter and diagrams on all Hawaiian OIB rocks, or all Icelandic lavas. Their LILE signature however is the same (though in lower concentration) as the alkaline rocks in which they occur. This may not mean the mantle is of alkaline composition, merely that the nodules are impregnated with alkali basalt melt or that the mantle is locally metasomatised. So while the nodules may tell us a good deal of mantle mineralogy, they do not tell us much of mantle composition as regards the LILE elements. Some lherzolite nodules are extremely enriched in LILE and have a Zr/Nb ratio of 4-5. Such for example are the amphibole-bearing nodules of Keguelen Islands, (Moine,B., 2001, J.Pet. 2143-67). Some nodule data is of erratic composition, a factor likely to be due to small sample size, nevertheless there is a common trend in all xenolithic nodules and in Alpine peridotites with a linear shifts in composition seen between pure olivine at the magnesian end, towards a high alumina (>22%) low MgO end member. (see variation diagrams for Hawaii, Canary Is, etc). Diamond pipes are also choked with nodules and fragments of "Kimberlite", eclogite and garnet lherzolites and appear to have introduced rock at the surface which has originated at depths of 100 miles or greater. Diamonds themselves sometimes include high pressure minerals brought up unchanged from regions of great pressure, and some very interesting work is being done on them. Some diamond pipes eg, the Roberts Victor Mine in South Africa mainly contain eclogites of garnet and omphacite pyroxene. Eclogites are also found in very high pressure exhumed geosynclinal terranes along with other high pressure minerals including glaucophane and kyanite and have been reported as pods in peridotites. Eclogites may have a composition (but not the mineralogy) of MORBs and appeals are being made to workers in this field to forward data. Dr Dan Schultze of Toronto U has kindly given us data from the Roberts Victor Diamond Mine in South Africa. The bulk rocks are unusual in including coesite, and have erratic compositions, eg with high (20  25% Al2O3) and vanishingly low soda. However SEM analyses of the garnet and omphacitic pyroxene show an unexpected wide range of compositions. Garnet from eclogites of the Robert Victor mine. We hope to add REE and other LILE data as they become available. Contributions welcome! Data just contributed (Mathias Barth, April/03) from eclogites from the Sierra Leone region of West Africa again show a wide range of crytstal composition and the whole rocks show very high Nb with a Zr/Nb of about 4. Were eclogites the lithospheric residue from andesite formation, this high Nb might explain the anomalously low Nb-Ta in all arc and continental rocks. Let us cogitate on this one! Examination of Alpine Peridotites. Many old continental fold belts include elongated lenses, often more than 50 km long, of ultrabasic harzburgite-dunite or of serpentenites which are a hydrated alteration product. These appear to be slices of the mantle, sheared off from the parent body and upthrust to the surface. At first sight these may provide the best possibilities of examined a piece of mantle directly. However, such slices have been through a long and complex history as has been revealed by studies of the Red Mountain ophiolite sequence in New Zealand, which we have been recently investigating as below. 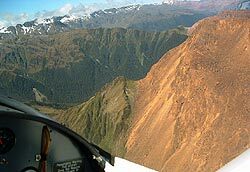 The Southern Alps are a folded range of schist and greywacke of considerable height (to 4000m) that extends for >600 miles long the western coast of the South Island of New Zealand. Near the western margin of the Alpine ranges and between Lat 44/05S and 44/23S (~40 km) are more or less continuous lenses or blocks of peridotite up to 5 km in width and rising to 1704m. Associated Permian ophiolitic volcanic rocks and much thinner lenses of ultramafite extend southwest, and curving to the South-east for another 100 km. (Coombs, et al,1976, AJS 276, 561-603). At the north-eastern extremity the ultramafites are terminated by the Alpine Fault, a major right-handed transcurrent fault that extends more than the length of New Zealand. 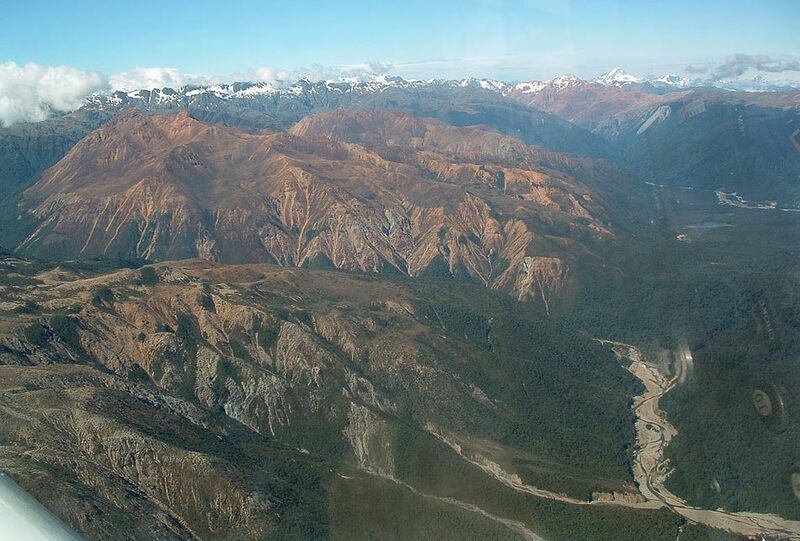 In the Nelson area, near Dun Mountain ( the type area for "dunite") and on the opposite side of the Alpine fault are a further 40 km of massive peridotite, once continuous with those of Otago. Again, thin discontinuous lenses extend for another 60 km to the north-east. In general the presumed base of the ultramafites is in fault contact to the east with the folded schist mountains. These veins and bands all give the appearance of being laterally segregated during protracted cooling, rather than by gravity stratification and crystal settling.. About 500m below the "top" plagioclase bands usually on 1-4 inch scale appear, sometimes at 7-10 inch spacing, usually subparallel to the pyroxene bands but again occasionally crosscutting. Short lenses of more than 12in depth may be seen, sometimes truncated by a thin diagonal band, The feldspar also includes plentiful secondary grossular garnet of secondary origin, also reported in massive serpentenite, even in the partings of diallage crystals, as well as in the marginal "Rodingite dikes", these latter being apparently mafic dikes of the overlying Livingstone Volcanics which have been converted to albite, grossular, diopside, vusuvianite rock. (Sinton, J., 1980,AJS 280A, 296-328). To the west the metamorphosed and serpentenised Livingstone Volcanics consist of banded gabbros and low-K MORB type basalts, thought to be derived from the ultramafites. On both sides of the now vertically standing peridotites, the outer 100m to 1km of primary rock has been completely serpentenised to antigorite, forming a very fine-grained dark grey tough rock which becomes greenish on exposure to air. The orthopyroxene megacrysts have been altered to bastite. Above the Livingstone Volcanics lie Permian calc-alkaline tuffs, tuffaceous sediments and limestone. We may speculate that the ultramafic rocks were brought up along the spreading centre that existed between Australia and New Zealand, that they were subject to partial melting giving rise to the overlying gabbros and lavas of the Livingstone Group, that the slab was carried to the south-east, slowly cooling from a temperature of perhaps 1170 deg C. During this long phase the pyroxene megacrysts formed and separation of pyroxene-rich and plagioclase layers probably took place. Reaching the Alpine subduction zone the slab would be subject to severe stress and part was sheared, upended and compressed against the massive continental sediments in Mesozoic time during the first phase of orogeny. A re-elevation of temperatures produced the chlorite schists of Otago which increase in metamorphic rank to the west and in places reach garnet-amphibolite facies. Whether the serpentenites along with formation of grossular garnet, and the separation of Ni as awaruite (FeNi3) were formed in the spreading centre  subduction zone phase, or later in the orogenic phase is still uncertain. Basically serpentinite has the composition of olivine plus 6 molecules of water, so from the point of view of the availability of water, the former is favoured. From the minimal data available, (eg Challis, 1965) the serpentenites have retained vanishingly small amounts of Ni compared to the usual 1800  2300 ppm found in fresh dunite-harzburgite. Awaruite has been found in placers in streams but is not seen in veins in serpentenites, only a tiny amount of chalcopyrite. Presumably it is strongly localised. The protracted cooling history, to be expected in such large masses have resulted in strong compositional differences on a scale of separation of mm to tens of metres. Little reliable information as to the original mantle composition and homogeneity can be expected to be gained. Moreover we do not know the degree to which these rocks were partially melted, assuming the Livingstone volcanics and gabbros were in fact derived from them. Almost identical decriptions have been made of other Alpine Ultramafics which appear to differ only in the degree of serpentenisation. The Horman peridotite in Hokkaido Japan, is a similar Apine peridotite mass but differing in being little serpentenised. 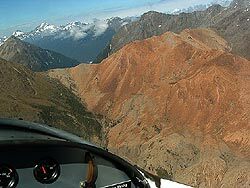 The same peroxenite and feldspathic bands occur, and similarly, an "Upper zone" is more iron-rich and giving trends of about 250 ppm less Ni. Variantion diagrams show very regular trends from dunite though harzburgite to lherzolite with 37% MgO and about 5% Al2O3 and CaO which increases steeply with decreasing MgO as do REE, Zr, Nd, V, Sc, Na, K group, Unfortunately the levels of many trace elements are so low and close to dection limits that patterns often cannot be discerned, There are associated rocks of lower than 37% MgO, often described as spinel lherzolite, or plagioclase lherzolite, some appear to be pyroxenites but no recent petrogaphic detail is as yet available. If the original mantle were homogenous then it must have had an MgO content not greater than 37% MgO, as this would ave the lowest partial melting point. However, even this requires very low degree melting to produce an EMORB let alone a melanephelinite. Recent Work on Mantle Nodules. The last few years have seen detailed work on the trace elements of both the peridotites and the included pyroxenes using ICPMS techniques. Marc Norman (1998) has examined the TE of nodules from Australian alkaline rocks; Yu Jinhai(2005) found enriched peridotite and LREE-enriched CPX from the basalts of the Leizhou Peninsular of South-Easern China, while Jianping Zheng (2005, Geoch.Cos.Act. 60, (13), 3401-3418) and in six more associated papers, has found a wide range of enrichment in peridotites of up to x 10 chondrite from Eastern China while the Shanwang clinoproxenes reach a LREE enrichment of x ~50 chondrite.